Fast and on-site: Elemental analysis of rock, sediment and soil. Element range starting from Na, detection limits for relevant trace elements significantly lower compared to other portable and handheld XRF instruments. At the production line: High productivity with application specific packages. Small footprint with high analytical power. The new portable SPECTROSCOUT ED-XRF analyzers deliver much of the analytical power of top-grade laboratory benchtop analyzers. They provide fast, dependable, truly lab-quality results in the field or on the production floor – all at a surprisingly low cost. The SPECTROSCOUT analyzers provide exceptional performance, at wide concentration levels, for all of the relevant elements in the range of Na-U. SPECTROSCOUT impresses with unprecedented precision and speed making it the ideal portable XRF for onsite applications where results matter. Available in two versions for field & offsite testing or laboratory & at-line testing, these new, portable spectrometers provide exceptional performance. Visit the SPECTROSCOUT Resource Center for more details and application examples. Simplified software is accessed via a touchscreen interface. Predefined application packages are designed to fit the task at hand. Unique iCAL calibration takes just one sample and only five minutes for standardization. And an optional integrated video system allows precise spot testing, plus image storage. Its light weight and small size makes SPECTROSCOUT the ideal portable XRF spectrometer solution for at-line as well as field and offsite applications. The SPECTROSCOUT is a much more affordable alternative to the at-line installation of larger and more costly laboratory instruments and can be operated with minimal introductory training. It is ideal for producers of processed or manufactured goods including chemicals, oil, metal surface coatings, pharmaceuticals, cosmetics, food, feedstock, and more. Application examples are available in the SPECTROSCOUT At-Line Resource Center. For many applications, a primary concern is the need to deliver analytical results on site. Sending samples back to the laboratory adds significant time delays to most projects. In fact, it may render some tasks impractical or impossible. As an example, real-time analytical results are essential for the determination of elemental compositions for mining and geological use, delivering the necessary data for assessing progress and for making data-based changes to the direction of drilling. Also jewelers, recyclers, and refiners of precious metals and alloys require elemental analytical capabilities with affordability and good analytical performance as the key features for determining percentages of gold, silver, and other precious metal alloys quickly and accurately at any place, so that advantageous deals can be struck. Service companies, government agencies, universities, corporations, and testing labs perform environmental screening of soil, sediment, waste, and waste oil in everything from development areas and landfills to military installations. Often they must test the material for heavy metals and other toxic elements directly in the field. For all such applications, the SPECTROSCOUT is a proven, onsite solution providing laboratory-class results that are affordable, fast, and easy. The new SPECTROSCOUT analyzer is the lab that goes anywhere. 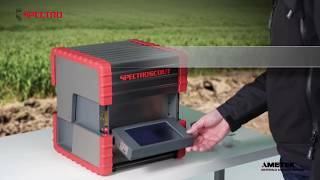 Watch video demonstrations of the SPECTROSCOUT – or click here to switch to SPECTRO on YouTube.com. This White Paper examines to what extent X-ray fluorescence analysis is an appropriate technique for the elemental analysis of polymers. A great advantage of ED-XRF analysis for rapid screening analysis is its ability to measure samples directly, with a minimum of preparation. Realizing this benefit, however, requires eliminating potential errors that can result when atoms in the sample matrix influence the fluorescence of others and thus the intensities measured by the spectrometer are influenced. Such effects, which include absorption and enhancement, when taken collectively, are referred to generally as matrix effects. For quality control applications, when the sample matrix is known or can be matched, a variety of standards-based XRF calculation procedures are available to compensate for undesirable matrix effects. However, creating the right basis for consistently high-accuracy results requires additional spectra handling functionality to determine the correct net intensities of the measured spectra. This paper explains why this additional functionality is a critical aspect of overcoming matrix effects and ensuring those consistently high-accuracy results. Precious metals require — and reward — careful analysis. But analysts face various difficulties. The scope of precious metals analysis extends from trace levels to 100%. Most of these metals are resistant to dissolution by all but the strongest acids. Some traditional analytical methods like fire assay are time-consuming and demand a high level of skill. Three modern techniques offer widely used solutions. Energy-dispersive X-ray fluorescence (ED-XRF) and optical emission spectrometry (OES) can be used without specialist analytical training to rapidly and accurately analyze bullion, jewelry, and alloys. A variation of OES, inductively coupled plasma optical emission spectrometry (ICP-OES), is an ideal tool for the analysis of bulk materials such as ores, and for the determination of trace impurities. Several instruments available from SPECTRO Analytical Instruments represent the state of the art in these techniques. This paper describes their application to precious metals analysis. Iron deficiency is the leading cause of death in childbirth. Zinc deficiency is linked to diarrhea, which kills nine million children a year. Micronutrient supplementation can go a long way to reversing such conditions, and farmers around the world are stepping up efforts to breed zinc- and iron-rich grains. As these grains find their way into infant cereals, milk-based powders, and premixes, precise monitoring of nutrient content is critical. Traditional lab-based quality control methods add substantial costs and delays to a process already operating with thin margins. Promising to change all of this is a new generation of high-resolution rapid screening technology that uses ED-XRF spectroscopy in an instrument designed specifically to conduct lab-quality elemental analyses at the production line. Accurate characterization of downhole well properties can yield tremendous benefits in assessing well quality, predicting content, geosteering and much else. With astonishing improvements in portable energy dispersive X-ray fluorescence (ED-XRF), petroleum geology engineers are now relying on this technology to rapidly characterize important samples in remote areas with minimal preparation and very high accuracy of analysis. ED-XRF instruments utilizing this technique have excellent analytical range and precision and low limits of detection. They can provide quick lab-quality analysis on a variety of geological matrices with a single calibration. These new instruments are providing crucial information on potential wells helping engineers to characterize a basin and determine optimal conditions for pumping. This paper offers three examples of how advanced ED-XRF is being used at the well site. Attention to food safety has been growing since the early 19th century. Most countries have enacted increasingly stringent food and safety legislation. Some regulations focus on “adulterants”, a legal term for substances that producers add to foods to increase quantity. Other regulations focus on “contaminants”, substances such as metals that might enter the food supply unintentionally through various stages of production, packaging, transport, and storage. Traditional lab-based quality control elemental analysis methods, ICP-OES or AAS, have been used successfully for years but add substantial costs and delays to processing schedules. Promising to change all of this is a new generation of high-resolution rapid screening technology that uses ED-XRF spectroscopy in an instrument designed specifically to conduct lab-quality elemental analyses right at the production line. This paper explains how the new, portable instruments are being used for rapid at-line elemental analysis to detect metals in food and shows the precise analytical results that they can provide. Arsenic, barium, cadmium, chromium, copper, lead, mercury, selenium, silver, and zinc are among the many contaminants that enter the environment through industrial, agricultural, other human activities and sometimes through natural causes. Addressing a contaminated site first requires identifying the contaminating elements and then determining the amounts that are present. Then a course of action can be prescribed for cleaning, removing, or isolating the affected areas. Determining the best course of action naturally requires detailed and precise information and this work has traditionally has been done in a laboratory. But ferrying samples back and forth to a laboratory can add considerable time and cost to the remediation process. Today however, astonishing improvements in portable energy dispersive X-ray fluorescence (ED-XRF) spectrometers enable environmental professionals to rapidly characterize samples in remote areas with minimal preparation and with very high accuracy of analysis. This paper explains the advantages of using ED-XRF spectrometers in the field versus traditional analytical methods and provides examples of their analytical performance. Sulfur content is a key quality determinant for many petroleum products. Knowledge of sulfur content impacts processing and assists compliance with government regulations. A number of standards have been developed to guide industry in monitoring sulfur levels. They define acceptable levels that range from 10 ppm for road fuels up to percent levels in heavy fuel oil. Analysis of sulfur in fuels using XRF across the full range of concentrations has traditionally been done in the lab but this often results in production delays. Now, for many applications requiring sulfur detection, a new generation of portable ED-XRF spectrometers enables accurate analysis right at the production line, shortening production delays from days to minutes. X-ray fluorescence (XRF) spectroscopy is an excellent technology for coat-weight analysis and can be performed with a variety of instruments, ranging from handheld systems to laboratory based WD-XRF cabinets. Laboratory instruments are expensive and can delay process schedules, as samples must be run back and forth from lab to line. Handheld XRF systems have been popular but have many practical and analytical drawbacks. This paper explains how a new generation of portable ED-XRF instruments can provide performance comparable to lab-based systems and offer the flexibility to be easily moved to various process points to provide high accuracy QA/QC. Lead ingestion is a common cause of farm animal poisoning. Even a trace can cause death, malaise, degraded performance, and render their meat unfit for human consumption. Lead can enter the animal food chain in many ways but among the most preventable methods of reducing lead contamination is to minimize its introduction into animal feed. To reduce animal feed contamination, the Dutch feed industry twenty years ago developed a toxicology certification scheme, which is now widely adopted as an international standard. The stringent standard defines acceptable levels of contaminants however meeting the requirements, until recently, required time-consuming laboratory analysis with expensive, high performance instruments. This paper explains how to use new, portable instruments for rapid at-line analysis that easily meets the standard. XRF-77: In-Situ Analysis of Traces, Minor and Major Elements in Rocks and Soils with a Portable XRF Spectrometer The rugged SPECTROSCOUT is a portable EDXRF spectrometer that provides precise and accurate analytical results for traces, minor and major elements in rocks and soils prepared as loose dried powder in disposable XRF sample cups. For the analysis, the SPECTROSCOUT was equipped with a sample spinner and a small vacuum pump to analyze all major elements starting from sodium in-situ. XRF-79: Analysis of Precious Metal Alloys Excitation of the fluorescence radiation in a sample by an X-ray tube has been optimized so that the required precision for the analysis of jewelry alloys can be achieved even with short measuring times, first results are typically displayed already after 7 to 10 seconds. The analysis screen supplies the operator with all necessary information at a single glance and can display the measurement result in different views - even during measurement. The analytical results are stored and can be displayed later, printed out and, after transfer to an external computer, processed with the “Result Manager” software. XRF-80: Environmental Monitoring and Geochemical Exploration with a Portable EDXRF Spectrometer The portable rugged EDXRF analyzer SPECTROSCOUT, in combination with an optimized Geo+ hardware and application package, provides precise and accurate analytical results for traces, minor and major elements in ores, rocks, sediments, soils and sludge prepared as loose dried powder in disposable XRF sample cups. The SPECTROSCOUT in this version is equipped with a sample spinner and a small vacuum pump to analyze all relevant elements in the range from Na-U in-situ. XRF-82: Analysis of Aqueous Samples with a Portable EDXRF Spectrometer The portable rugged EDXRF analyzer SPECTROSCOUT, in combination with an optimized hardware and application package, provides precise and accurate analytical results for traces and minor elements in aqueous samples poured in disposable XRF sample cups. The SPECTROSCOUT in this version is equipped with a sample spinner and a He purge system to analyze all relevant elements in the range from Mg-U in-situ. XRF-83: Analysis of Oil-Based Samples with a Portable EDXRF Spectrometer (PDF, en) The portable rugged EDXRF analyzer SPECTROSCOUT, in combination with an optimized hardware and application package, provides precise and accurate analytical results for traces and minor elements in oil-based liquids poured in disposable XRF sample cups. The SPECTROSCOUT in this version is equipped with a sample spinner and a He purge system to analyze all relevant elements in the range from Mg-U in-situ. XRF-84: Fast and Accurate Determination of Rh, Pd, and Pt in Used Automobile Catalysts with a Portable EDXRF Spectrometer The portable rugged EDXRF analyzer SPECTROSCOUT, in combination with an optimized Geo+ hardware and application package, provides precise and accurate analytical results for precious metal elements in used automobile catalysts. Simultaneously the content of other important elements like Y, Zr, Ba, La, Ce, W and Pb are determined as well. Samples are prepared as loose dried powder in disposable XRF sample cups. The SPECTROSCOUT in this version is equipped with a sample spinner and a small vacuum pump to analyze all relevant elements in the range from Na-U in-situ. XRF-85: Analysis of Soil and Sewage Sludge with a Portable EDXRF Spectrometer The portable rugged EDXRF analyzer SPECTROSCOUT, in combination with an optimized hardware and application package, provides precise and accurate analytical results for traces, minor and major elements in ores, rocks, sediments, soils and sludge prepared as loose dried powder in disposable XRF sample cups. The SPECTROSCOUT in this version is equipped with a sample spinner and a He purge system to analyze all relevant elements in the range from Na-U in-situ. XRF-86: Analysis of Sulfur in Fuels according to ASTM D4294 with a Portable EDXRF Spectrometer (PDF, en) The portable rugged EDXRF analyzer SPECTROSCOUT, in combination with an optimized hardware and application package, provides precise and accurate analytical results for traces and minor elements in oil-based liquids poured in disposable XRF sample cups. The instrument also can be specifically calibrated to analyze the S content in fuel in accordance to ASTM D4294. Click on the link below to further explore the SPECTROSCOUT.